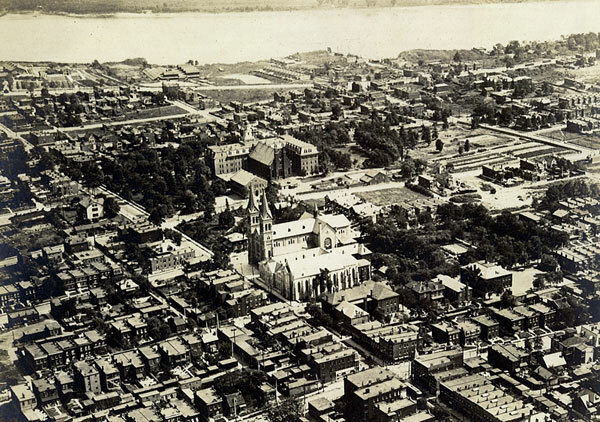 In 1860, more than 60,000 German immigrants, most of whom were Catholic, were living in the city of St. Louis. Many German farmers had settled the area known as Dutchtown in the southern area of the city. To meet the needs of these immigrants, Archbishop Peter Richard Kenrick decided to establish a parish midway between Sts. 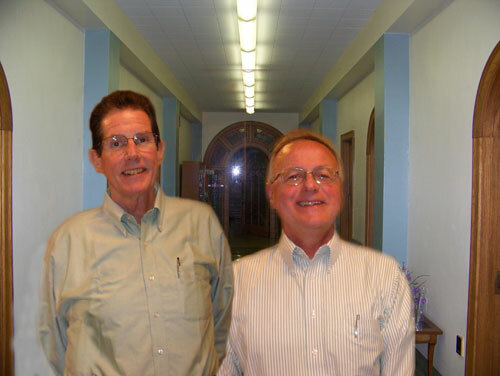 Peter & Paul in Soulard and St. Boniface in Carondelet. 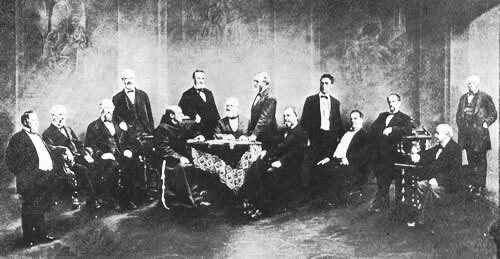 The Archbishop needed to find German-speaking priests, and as early as August 1861, he appealed to the Franciscan Friars in Southern Illinois. These friars had arrived in 1858 from Saxony, Germany. Franciscan friar Fr. Servace Altmicks, OSF and three other friars were sent to establish the new parish of St. Anthony of Padua. 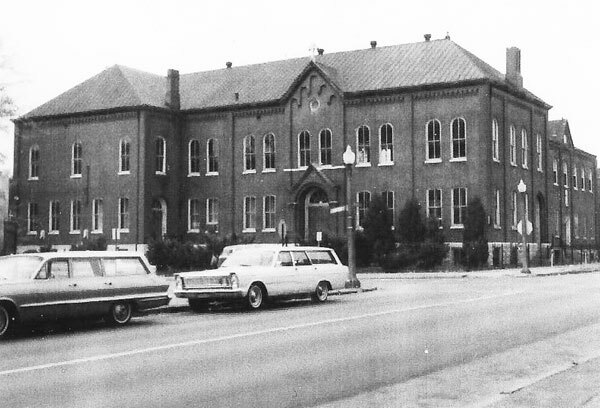 An initial registration of Catholics in the Dutchtown neighborhood turned up 70 German-speaking families, 25 English-speaking families, and 117 Catholic children of school age. They would gather for Sunday Mass at The House of Refuge, a local orphans home (on the site of today’s Marquette Park). However, the Union Army confiscated the building in 1863 to use for additional hospital space during the Civil War. Parishioner Mr. John Whitnell donated a small frame house which then became a temporary church and residence for the parish and the friars. It was a happy and thankful little group that attended the newly formed parish’s first Mass on Feb. 5, 1863! Much of Fr. Servace’s time was taken up building a permanent church building and monastery. Since the monastery was to be simple with the spirit of poverty for the first four friars, it was built quickly. 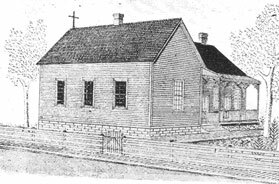 The new church was built on the corner of Meramec and Kansas Avenue (now Compton). The cornerstone was blessed in 1864 and consecrated in 1869. Designed by Bro. Adrian Wewer, OSF, it was pure Gothic in style, constructed of limestone quarried not far from St. Anthony’s. The seating capacity was 700. At the front of the church, a single spire extended 170 feet. The value of educating the children of the parish was a priority from the very beginning. In 1863, the Franciscans gathered the children and began to conduct classes in a frame house in the neighborhood. When the church was completed in 1869, they moved to a room in the church basement. A school building was built in 1870, and with the ever-growing number of students, additions were made in 1885, 1889 and 1894. A new building was built in 1901 for boys, and a girls school (which included a high school) was built in 1924. An elementary school building on Compton combined the boys and girls schools under one roof in 1963. Even though the schools were merged, Catholic education continued to be a strong value in the parish through 2005. By the beginning of the Twentieth Century, the original stone church had become too small for the growing parish. Fr. Timothy Magnien, OFM, who succeeded Fr. 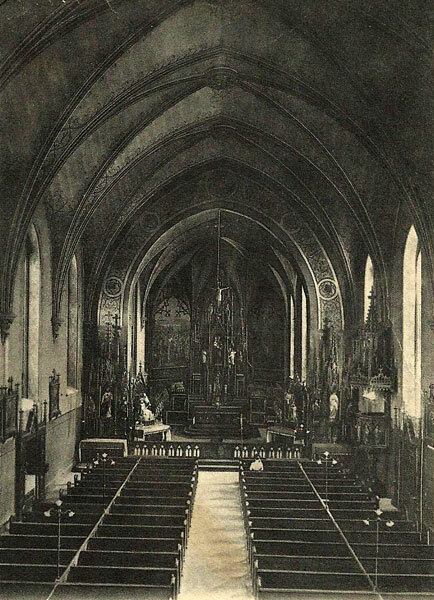 Francis Albers, OFM as pastor in 1902, proposed widening the church and building a clerestory for $90,000. He began to collect funds for the project, but before the work of remodeling the church could begin, he was transferred. Fr. Bernard Wewer, OFM was named pastor in 1906. After consultation, he decided instead to build a new church. 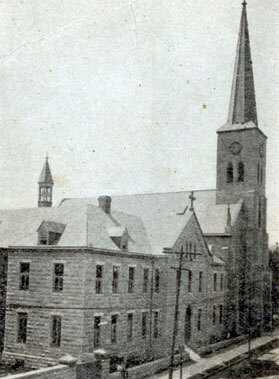 Franciscan Brother Anselm Wolff, OFM was chosen to be the architect of the new church building, and construction began with the cornerstone laid on July 4, 1908. The new church was a large and beautiful German Romanesque edifice. Its chief characteristics were rounded arches and curved lines throughout, a floor plan laid out in the shape of a cross, and rounded and vaulted ceilings. Because it was built on the corner of Michigan and Meramec Streets — the highest point in the city — its 175-foot twin towers could be seen for quite a distance. The magnificent art glass windows were executed in the studios of Emil Frei, a master German craftsman. The church opened in 1910 with a seating capacity of 1,400. The final cost to build the church was $175,000. The church was refurbished in 1963 for the parish centennial, and again in 1991. 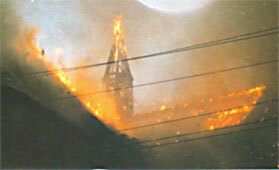 On April 28, 1994, lightning struck the church, setting the roof on fire. Over one hundred firemen helped to fight the blaze, which many thought would destroy the building. The building survived the blaze and subsequent water damage, and restoration was immediately undertaken. Although parishioners were permitted to celebrate Christmas Mass in the church in 1995, full restoration wasn’t completed until April 1996. Still under the leadership and vision of the Franciscan Friars of the Sacred Heart Province, the parish of Saint Anthony of Padua continues to be a cornerstone in the southside Dutchtown community, growing with and serving the local neighborhood. 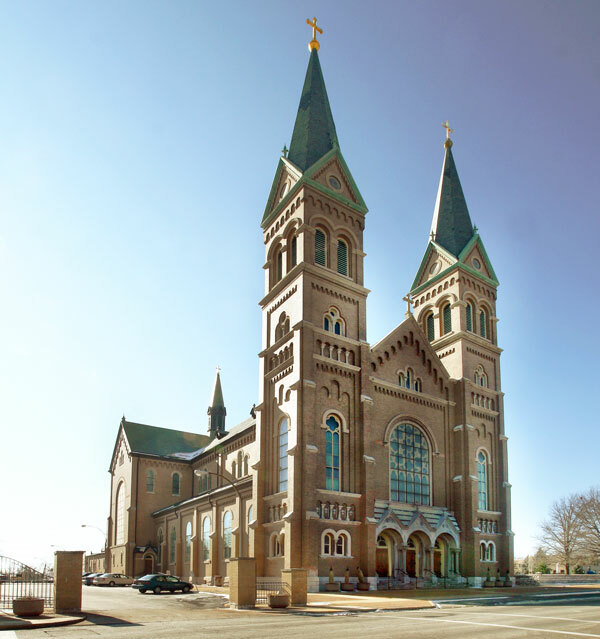 Both families with ties to the original German parishioners and those representing St. Louis’ diverse cultures of today are proud to call St. Anthony of Padua their spiritual home. 6 living pastors of St. Anthony of Padua, taken in June of 2008.